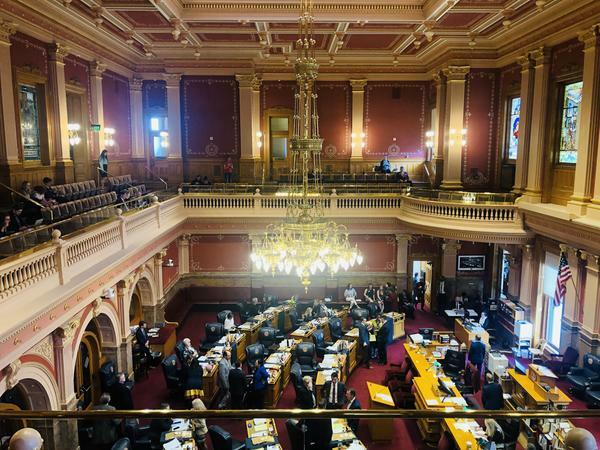 The Colorado Senate discusses the state budget Wednesday afternoon. A bill to create a paid family leave program stalled in the Senate Finance Committee. The proposal from Winter and other Democrats would allow someone to take up to 12 weeks off work each year to bond with a newborn, care for a sick parent or family member or recover from domestic violence. Scott Franz reports on efforts by state lawmakers to create a paid family leave program. Winter, a Democrat from Westminster, is so motivated to create the family leave program, she pressed forward with the bill's first hearing at the same time a blizzard hit Denver. Few people braved the power outages and whiteout conditions to testify. But when the bill advanced to its second hearing a few days later, dozens of people showed up to weigh in. Jasmine White told lawmakers she cut short her unpaid maternity leave about four years ago because of the financial stress. "I was worried about not being able to provide for my daughters," White said. "I was scared of being homeless with two young children. And I was terrified child protective services would get involved if that happened." White strongly supports a paid family leave program. She told lawmakers it's a shame some mothers in the state are returning to work just two weeks after giving birth. "I see it as a way to just help others who are in these detrimental situations and don't have anyone else to fall back on," White said. So what would it cost to help workers like White? Under the current version of the bill, workers in the state would contribute about 0.32 percent of their annual salary to the family leave program. That means if you make $60,000 a year, you would pitch in about $3.69 each week. Employers would contribute an equal amount. A University of Denver study estimates workers would receive an average benefit of $671 every week they are on leave. But some Republican senators, including Paul Lundeen, have concerns. "Business may in fact be tipped over," Lundeen said at a hearing about the bill. "They are just surviving today. And even though there is a small amount of financial expense associated with this, the additional disruption the other elements this bill puts on business may force some of these businesses, especially small businesses, out of business." There are also concerns from business owners and their employees. Rebecca Edlund is an office manager for a small non-profit organization. She said her boss let her work from home while she took paid leave to take care of her newborn. But she fears the state's new program would hurt businesses by removing that flexibility. "If this bill passes, organizations like mine, family operations, small companies around the state and their employees — not just the business owners, their employees as well — will lose," Edlund said. After hearing several hours of testimony, the Senate Finance Committee decided to table the bill so Sen. Winter and the other sponsors can work on amendments. "We've been meeting with a lot of stakeholders listening to concerns, gathering ideas and we have a package of amendments we're to be presenting that we think makes the bill stronger," Winter said. "It definitely is a Colorado solution." Winter said she's trying to alleviate the business community's concerns. "Amendments giving businesses more options on how to participate in the program are going to be the biggest changes we'll see," she said. Winter said the bill could come back for more debate as soon as next week. Colorado would become the seventh state to adopt a paid family leave program.